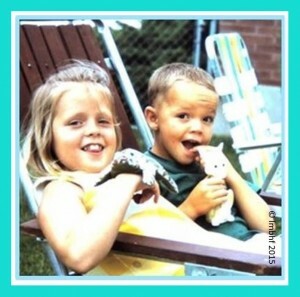 As a little girl growing up, my cousin Charlie and I were the best of friends. We lived just a block apart and we rode bikes together, built tents, caught grasshoppers, and ran through the sprinklers! And one day we fried sparrow eggs! My daddy’s yard was beautiful and had lots of trees in it. The sparrows loved all those trees and they would build their nests in them, lay eggs and raise their young. This particular summer, for some reason we happened to find some of those eggs on the ground. “Well, that was unfortunate,” I thought, “because it would have been good to have permission, and also to be able to ask for advice, like “what to use to fry them in.” At least my sister was busy with her soap opera and was unlikely to interfere with our little experiment. Since those tiny sparrow eggs were way to small to cook in a frying pan, I found a lid to a mayonnaise jar and Charlie and I cracked those eggs right into our makeshift pan and turned on the burner on our electric stove. (Yes, I know this was very dangerous and kids should never play with the stove! But hey, I was a precocious nine year old and my babysitter was, well… momentairly distracted). It didn’t take but a minute and smoke was rising up and we smelled a funny smell. The paint on our “pan” was on fire! To our utter disappointment our eggs hadn’t even begun to cook yet, but we knew that smoke and smell would bring my big sister running pretty quick! Alas, we had no choice but to turn off the burner and whisk our failed experiment into the sink (before we burned the house down)! 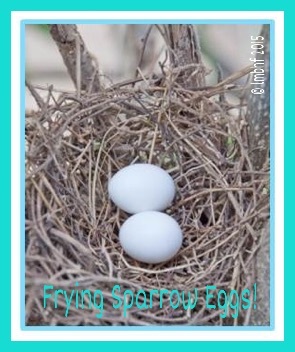 It seems my big sister was right after all, frying sparrow eggs certainly wasn’t a good idea! Hahaha, Brandee! Very good point! I’d never thought of that. « April 2nd is Autism Awareness Day!